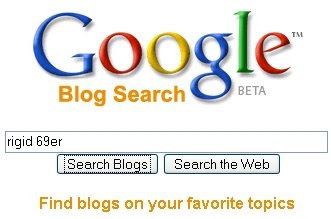 Noticed somebody surfed in through this search portal the other day, so I back tracked and found the Google Blog Search engine. Pretty nifty and if you want to see the actual search just click on the Google image above and it should automagically transport you to the search page, otherwise, click this: Google Blog Search Rigid 69er. If you run this search there are approximately 58 references so it's pretty cool to see this catching on. There are some good pix of different bikes out there. In fact, check this KHS softie out! I think if I ever get a softtail in the 26er variety I would build up one of these, and with gears!